Well, I'm back. For those of you who still have me tagged somewhere - I'm here, I'm alive and, natch, I'm knitting. Most of my knitting notes are on my Ravelry project pages, but not all are members! So, from the top, then, shall we? 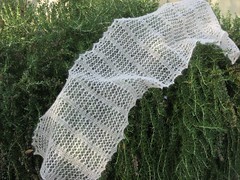 Lace Ribbon scarf is a Christmas present for a much loved aunt. I must love her! This the second scarf (she felted the first one and then lost it) and it is a bit of a dozy for the small yarn and the small needles - size #3. She only wears tan and white. Won't this look great as a subtle accent? Oh, it is also superwash - no felting possible! The beenie is for LB (little boy) That kid just loves orange! The brighter the better. The pattern is from the amazing brooklytweed. 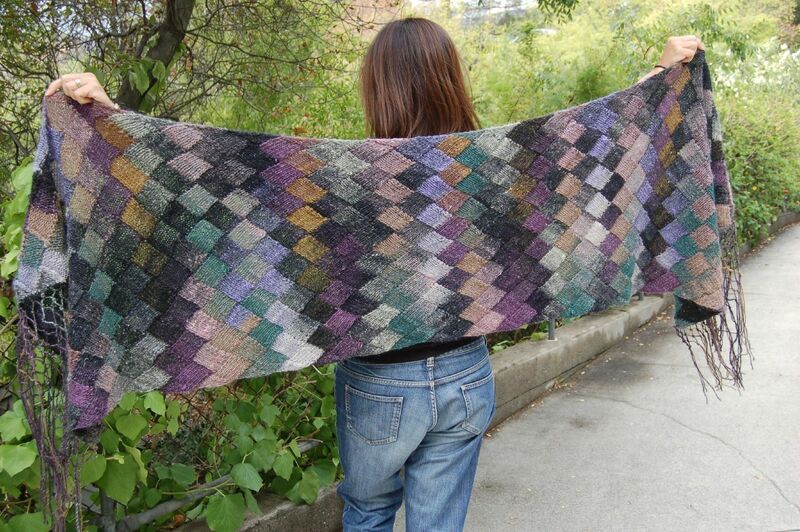 Only a knitter would get completely jazzed by the fact that the stripes start off round, but then turn into squares. Fortunately, LB is a knitter. Sort of. He knits when there isn't anything else to distract a curious, active, nearly 12 year old. Ok, he almost never knits. But he knows how!!! The cowl is a clever Mobieus Cowl named Prickle. The lace stitch is named the Porcupine stitch - I'm really at a loss as to why. The Mobieus is very cool because it drapes just perfectly to cover your decollete, yet does not fall off. Then you can pull it up like a hood and look incredibly demure and ladylike. Those of you who know me in the physical world should kindly stop laughing now. Thank you. The Boy Vest happened before the Mobieus Cowl. I scored several balls of Mission Falls 1824 Wool from the sale bin at Compattos (this is now my fav yarn store). I knew that straight up stockinette was the way to show off this yarn - but what to do? 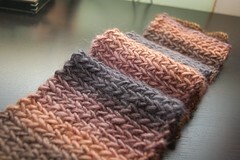 A combo of Ann Budd's Sweater Pattern Book and Leftovers from Knitty was just the ticket. I really feel like this was me, knitting fearlessly. All I had was a swatch, a picture in my head and some technique guidance. The waist shaping, arm scythe, and neck/armbands was pretty much impromptu. I am VERY happy with the result. Ok, the tank that matches the Collared shrug is very cute. It is also very short! Move just so and the belly button is out for all to see. This is fine for a 15 year old. Not so much for a 45 year old. But, damn it all to bloody hell! I knit the thing, it is way cute and I wear it, BB and all. Deal. The collared tank is nearly a knitting no-no. I haven't had many of these in my knitting career, so I guess it is ok. It is wearable, after all. It is possible the pattern is great and I am just not "getting it", but in the picture the points of the collar are perky and pointing toward the tops of the shoulders. 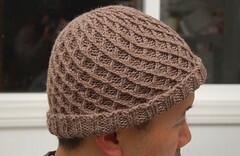 I fiddled and finagled the finishing every way I could and, brother, that is just not possible with the pieces as knit. 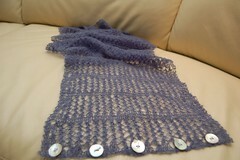 I was so put out, I contacted the publishers of KnitScene, because the designer is nowhere on the net. No. Where. They helped by telling me the pattern is right. Yeah. The first two pics are how the shrug is supposed to lay - still not like the model, but somewhat close. I'd have to stay completely immobile for this to stay. The third pic is how the thing actually wears - not hideous, but not sophisticated. 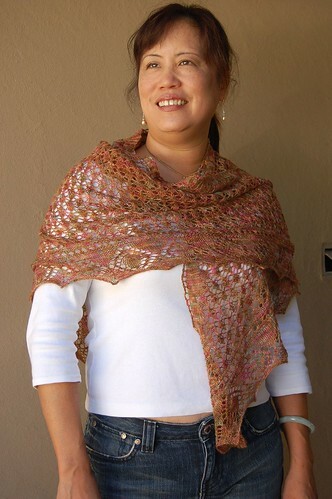 Since I held the cotton double, I may frog this someday and make a better fitting garment -right after I knit through the rest of my stash. Last, but certainly not least, is Ariann. This sweater was wicked hard for me. I still don't have the hang of increasing and decreasing while maintaining a lace pattern, in the round. I kept winding up with the wrong number of stitches. I wanted to make this for myself, being the narcissist that I am, but Momma wanted a sweater. "But Momma", I say, don't you want a scarf or slippers or something fast?" 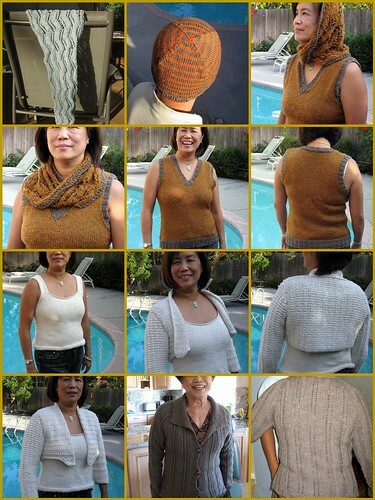 No, she wants to brag to her mah jong cronies that her daughter knit her a WHOLE sweater. "But Momma", I say, "Why do you want me to start now? I'll finish in the middle of August, not exactly wool sweater wearing sweater in LA, you know". "Daughter", she says, "I'm not going to be around forever!!" True, that. Here's your sweater, Mom. Stick around for a while, will ya?